1. 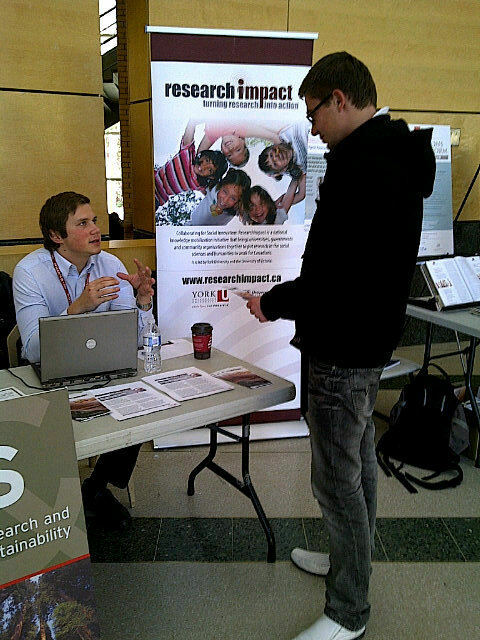 Students care about research – I was impressed with the number of undergraduate students who had genuine interest in research being profiled. This went beyond their obvious desire to find employment. Students cared about research and while this was not necessarily surprising, it was very impressive. 3. Let’s hear it for York Research Communications! Even if she is a staff of one, Elizabeth Monier Williams is always expanding her efforts to showcase and support York Research through relevant communications efforts. 4. Knowledge Mobilization fits in well to the research landscape at York. I’m proud we were present at all four research fairs. It is important to be visible but more important to be relevant, and I believe we have achieved a level of recognition and respect. We have considerable work to do still, but we’re moving in a positive direction! What an excellent opportunity to introduce York research to students. Most undergraduate students have little awareness of the importance of university research until graduate studies. Having such a showcase for the types of research being done at the university seems like an interesting and informative way of sparking student interests, and a great way of mobilizing knowledge.